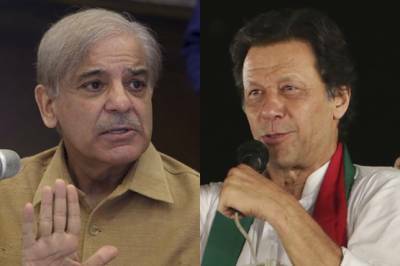 LAHORE – Shahbaz Sharif hits back at PM Khan over his tweet of two laws in Pakistan over the issue of pre bail arrest of Hamza Shahbaz. Opposition leader Shehbaz Sharif took a jab back at premier Imran Khan’s oblique tweet targeting Lahore High Court’s (LHC) order in the context of Pakistan Muslim League- Nawaz (PML-N) leader Hamza Sharif’s pre-arrest bail on Saturday. Earlier today, information minister Fawad Chaudhry, Punjab government spokesperson Shahbaz Gill and other Pakistan Tehreek-e-Insaf (PTI) members also criticized the LHC’s pre-arrest bail to opposition leader in Punjab assembly.